Leslie Byrne made Virginia history in 1992 by becoming the first woman elected to Congress from the Old Dominion. “I am Virginia’s first Congresswoman, but now my job is not to be a historical footnote,” she told reporters. “My job is to serve.”1 Elected as part of a large, reform–minded freshman class, Byrne sought to protect the northern Virginia families and federal government employees that formed her base constituency. She also proved fiercely loyal to the Democratic Party, proposing punishment for subcommittee chairmen who refused to support President William J. Clinton’s economic initiatives. Leslie Beck was born in Salt Lake City, Utah, on October 27, 1946. Her father, Stephen Beck, was a smelter, and her mother, Shirley, an office manager.2 She attended Mount Vernon College, in Mt. Vernon, Ohio, and the University of Utah in Salt Lake City, where she majored in psychology and drama, graduating in 1965. During her sophomore year, she married Larry Byrne, and the couple eventually moved to Falls Church, Virginia, in 1971, where they raised two children, Alexis and Jason. 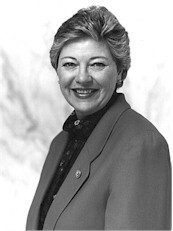 Leslie Byrne served as chair of the Fairfax County commission on fair campaign practices from 1978 to 1980, and as president of the Fairfax Area League of Women Voters from 1982 to 1983. Byrne was elected to the Virginia house of delegates, where she served from 1986 to 1992. Her greatest legislative triumph in the state legislature was forcing a bill out of committee, against the wishes of party leadership, requiring open container trucks to be covered with protective tarps. She gained a reputation as an outspoken legislator who often showed disdain for opponents by putting on lipstick during floor debate.3 When the legislature adjourned from its brief annual sessions, Byrne worked as president of a human resources consulting firm. Byrne’s one term in office focused on protecting and increasing benefits to the families and federal employees in her district, particularly concentrating on health care, education, and retirement benefits. She sponsored legislation that expanded childhood immunizations and provided more funding for Head Start education programs, arguing that money spent on young children would head off far more expensive problems in the future. Byrne introduced a bill that would allow penalty–free withdrawals from retirement accounts to purchase homes or to pay for education expenses. She proposed evaluating Social Security benefits providing minimum health care and health insurance for the elderly, as well as adding services to this benefit, such as in–home health care and nutritional counseling. In the 1994 election, Byrne faced Republican challenger Thomas M. Davis III, the Fairfax County board chairman. Davis emphasized fiscal restraint and conservative values, while highlighting the need to aid the disadvantaged.14 Byrne went on the offensive, touting her legislative achievements for families and painting Davis as unfriendly to unions.15 In a hotly contested race, Davis defeated the incumbent in a Republican sweep in which the GOP took control over the House of Representatives for the first time in 40 years, collecting 53 percent of the vote to Byrne’s 45 percent. After leaving the House, Byrne was an unsuccessful candidate for the 1996 Democratic nomination for a Virginia seat in the U.S. Senate. From 2000 to 2003, she served as a Democrat in the Virginia senate. In June 2005, Byrne won the Democratic nomination for lieutenant governor of Virginia but lost narrowly in the general election in November 2005. 1Lorraine Woellert, “The ‘Schoolyard Bully’ Byrne Expected To Be Partisan, Effective on the Hill,” 1 January 1993, Washington Times: B1. 2Eric Lipton, “Byrne Says Conviction of Purpose Drives Her Rough–and–Tumble Style,” 20 October 1994, Washington Post: C4. 4Peter Baker, “Byrne Was Subtle in Trailblazer Role; Voters Considered Woman More Likely to Effect Change, Analysts Say,” 5 November 1992, Washington Post: C12. 5Jim Clardy, “House Hopefuls Steer Clear of Bush Coattails,” 28 October 1992, Washington Times: B1. 7Politics in America, 1994 (Washington, D.C.: National Journal Inc., 1993): 1602. 8Craig Winneker, “Women and Blacks Augment Numbers on Top Panels as Parties Fill 292 Slots,” 14 December 1992, Roll Call. 10Almanac of American Politics, 1994 (Washington, D.C.: National Journal Inc., 1993): 1330. 11Politics in America, 1994: 1601. 12Timothy J. Burger, “Rosty, Dingell, Frosh Seek to Unseat 11 Chairmen Who Bucked President,” 31 May 1993, Roll Call. 13Almanac of American Politics, 1994: 1330; see also, Jim Clardy, “Byrne Draws Fire From Caucus,” 10 June 1993, Washington Times: A4. 14Eric Lipton, “Lessons Learned in Complex Youth Moderate Davis’s Political Approach,” 20 October, 1994, Washington Post: C4. 15Eric Lipton, “Burnishing the Byrne Image,” 6 October 1994, Washington Post: V3. Papers: In the Dottie Schick Collection of Political Memorabilia, ca. 1926-2004, 22.75 cubic feet. Persons represented include Leslie Byrne. Papers: In the Emilie F. Miller papers, 1987-1991, 48 linear feet. Persons represented include Leslie Byrne. Papers: In the Planned Community Archives collection, 1960-2009, 175.5 linear feet. Persons represented include Leslie Byrne. Papers: In the Agnes Wolf papers, 1966-2006, 12.5 linear feet. Persons represented include Leslie Byrne. "Leslie L. Byrne" in Women in Congress, 1917-2006. Prepared under the direction of the Committee on House Administration by the Office of History & Preservation, U. S. House of Representatives. Washington: Government Printing Office, 2006.